At the National Alliance for Grieving Children conference, Dr. Gloria Horsley connects with Makiko Matsumoto from Tokyo, Japan. Last year, she went to The Dougy Center in Portland and decided to start a similar grief support group in Japan. So far, the efforts have been great. However, it’s difficult to communicate with the members and to find children who may benefit. There’s no such thing as “grieving children” in Japan, which makes it difficult to talk about grief and loss. Children may not want to talk about grief because they don’t want to worry their parents. Matsumoto’s goal is to reach out to children and let them know they’re okay, that they can cry, and to provide a safe space. Like many Asian cultures, the Japanese don’t talk about death openly and therefore the grief process is kept a secret. In some older generations, talking about death can be considered bad luck. This has led to many obstacles when it comes to grief healing. The Dougy Center is considered the gold standard amongst grief centers in the US, and is an excellent model for the Japanese. However, without clients and children, there can’t be any success. Matsumoto is looking for ways to encourage parents to bring their children to the center. It takes a lot of outreach and education, but it’s slowly being embraced. 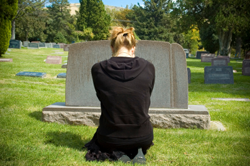 Being the first in anything is difficult, especially when it has to do with grief and loss. Still, she’s confident that in time her community will come to know the benefits of bereavement work. Working with professionals, upping marketing efforts, and of course having passion for the project is critical. Grief journeys are unique, as are cultures.